For this new seasonal list (another one!! 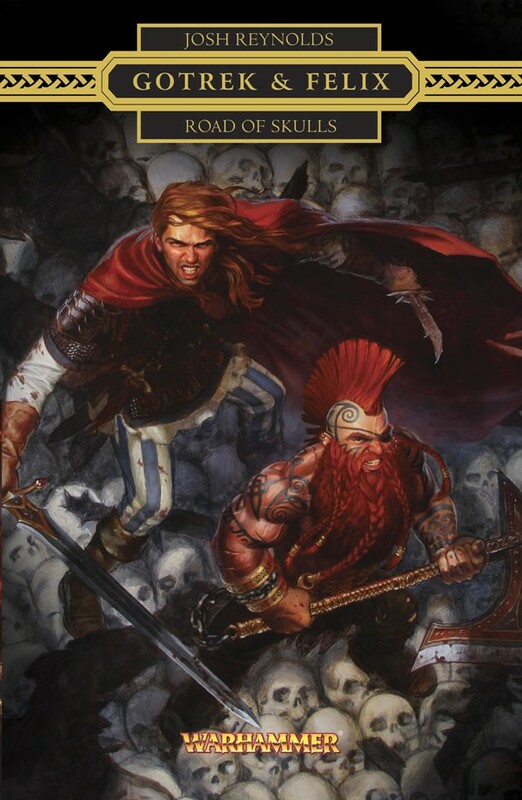 ), for the best SFF characters I’ve read this year, my first pick is the duo of Gotrek & Felix from Josh Reynolds’ Road of Skulls, a part of the Gotrek & Felix series, a mainstay for the Warhammer Fantasy setting from Black Library (Games Workshop). Hit the break to see why I picked these two characters. William King’s Trollslayer, the first Gotrek & Felix novel, was one of my first Warhammer Fantasy reads and I remember that book very fondly because of the odd pairing of a human warrior-poet (Felix) and a disgraced dwarf (Gotrek). While out in Los Angeles with a couple friends (we’d gone into downtown to watch a stage performance of Wicked) back in the Winter of 2007, we happened to chance into a Borders and since I was undergoing a resurgence of interest in all things Warhammer at the time, I picked up Gotrek & Felix: The First Omnibus and finished Trollslayer quite quickly since it was an anthology of sequential short stories rather than a typical novel. William King eventually ended up taking a long siesta from the series and Nathan Long was brought in to helm the series. Now with Nathan’s departure, and despite William King returning to Black Library, the series has seen a sort of rebirth with the main series itself being put aside for the moment and new authors being brought in to write spin-off stories set around the events of the various novels. The first of these, released in January this year, is Road of Skulls by Josh Reynolds and it is most definitely one of the best fantasy novels I’ve read this year. Pretty much everything about this novel is fantastic and you can read more of my thoughts in the review for it. There was also an audio released later on, Curse of the Everliving by David Guymer, and it too was good. David also wrote a novel, City of the Damned, but I haven’t been able to get around to it as yet. As things stand right now, Josh has another novel coming out next year, Serpent Queen and I’m quite excited about that one as well. 2014 might well be a Gotrek & Felix year for me! Posted on December 25, 2013, in 12 Days of Best SFF Characters of 2013, Book Lists and tagged 12 Days of Best SFF Characters of 2013, Black Library, Book Lists, Dwarves, Epic Fantasy, Fantasy, Felix Jaeger, Gotrek & Felix, Gotrek Gurnisson, Heroic Fantasy, Josh Reynolds, Road of Skulls, Warhammer, Warhammer Fantasy, William King. Bookmark the permalink. Leave a comment.